Aqueous cleaners: These are alkaline water based solutions or phneutral solutions which are well known to remove dirt by breaking it down from part surfaces. Solvent cleaners: Solvent cleaners dissolve dirt and then clean. These type of cleaners include Stoddard solvent, mineral spirits, petroleum naphtha, benzene, trichloroethane, xylenes etc. While both these cleaners should be used to clean the parts washer, it is essential to know which one is the best. How to manage aqueous cleaning waste? Solvent parts washer contains several gallons of solvent which is stored in a settling pan at the bottom of the washer. An electric liquid is immersed in the solvent to extract clean solvent from near the top of the tank which is then pumped at low pressure. The pressure is applied through a flexible nozzle above the liquid where the metal components rest. Then dirt gathers at the bottom of the tank and mineral spirits remove oil, burnt on carbon, grime and grease etc. effectively. But its continued use contributes to health, environmental and economic issues. As you can see, petroleum solvents, if improperly handled can cause major harm. So the usage must be restricted whereas the aqueous based cleaners are better and safe to use. Check out. These are water based cleaners used in repair and maintenance. It is like a dishwasher in which water and detergent are used in combination with mechanical and heat energy. Also, they are non-hazardous and non-flammable. These cleaners break up dirt and grease using heat, pressurized water and soap rather than dissolving grease. The most commonly used cleaning system is sink on a drum. A brush is mounted on a drum in a sink that contains water based cleaner. With a flow brush and faucet, the parts are cleaned and the cleaner is heated to 105 degrees F. It has filter to remove oil and other dirt particles and it is made of plastic or metal. For cleaning, hands are used so the formula used in this technique must have neutral ph to prevent any skin damage. This unit has a sink with false bottom which can be opened or removed to soak the parts inside. It also contains a faucet and flow brush to clean the parts with hands. The units are heated to 105 degrees F and also have filters with metal or plastic units. The parts washer is put inside the cabinet and the door is closed to apply high pressure spray from the nozzles. This method flushes and cleans the parts like a dishwasher does the dishes. This one is the most aggressive techniques and also there is no need to touch the parts to clean them. The formulation is heated up to 180 degrees F. They are made of good metal and have filters too. As spray cabinet cleaning is automatic, it cuts down labour costs. These are the modified version of sink on a drum unit. Made of plastic, they are heated to 105 degrees F. It is an enzyme cleaning formulation to support the growth of microbes as they biodegrade the oil. Any type of debris, dirt and grease is bath cleaned without any change out. For cleaning, this system relies on sound energy. It causes bubbles to form which explode in holes to clean the parts. This process is called cavitation. To clean complex parts like carburettors and transmissions, this method is the most effective one. Also, no need to use hands for the cleaning process as it is an automated cleaning system. Aqueous wastes should be managed properly and disposed off in a right manner because disposing them in storm drains, grounds, or drywells is illegal. As they are less harmful than petroleum solvents, it is less expensive to dispose them off. 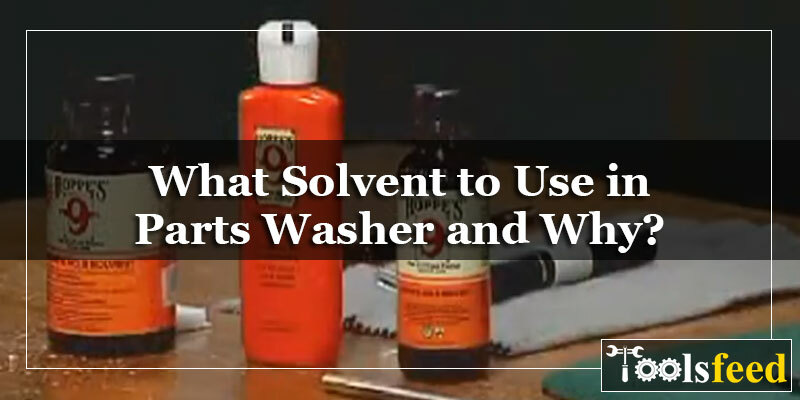 So this was all about the solvents to use in parts washer. As it is quite clear that aqueous based cleaners are much better than petroleum solvents because they don’t contain any harmful ingredients to affect anyone’s health. Buy an appropriate aqueous cleaning solution and take your parts washer cleaning to a new level. Happy cleaning!